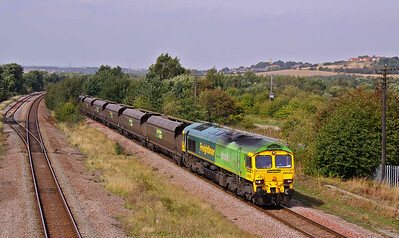 66501 ‘Japan 2001’ heads 4L87 11:24 Leeds FLT - Ipswich SS past Frinkley Lane on 26/09/15. 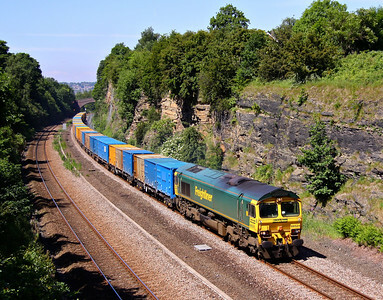 66502 ‘Basford Hall Centenary 2001’ heads 4O55 12:12 Leeds - Southampton containers past Portway on 08/10/13. 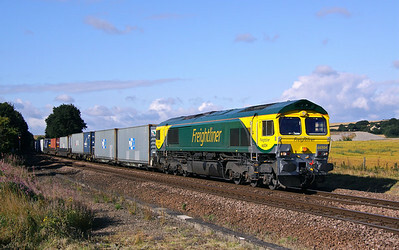 66503 'The RAILWAY MAGAZINE' passes North Stafford Junction with the diverted 4L90 07:11 Lawley Street - Felixstowe. 30/04/11. 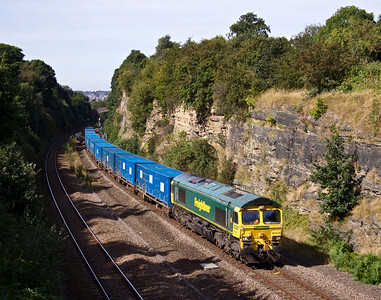 66503 exits Sheffield past Woodseats Road with 6M89 09:51 Dewsbury - Earles Sidings empty cement PCA’s on 22/09/00. 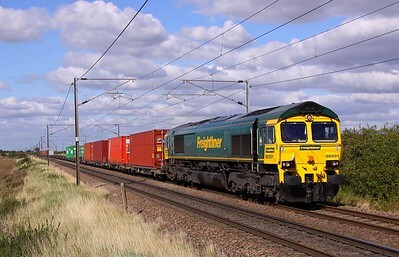 66504 looking smart in new Freightliner Powerhaul livery heads North past Slitting Mill with 4E01 Southampton - Leeds Containers on 19/08/13. 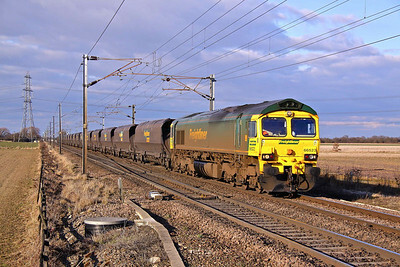 66506 'Crewe Regeneration' passes the semaphore signals and signal box at Winning Junction with 4N04 07:15 Drax Power Station - North Blyth coal empties'. 03/05/11. 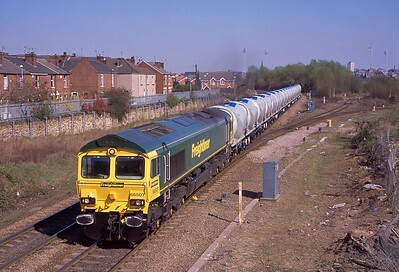 66507 heads past Holmes junction with a rake of new refurbished PCA’s, forming 6Z66 14:00 Doncaster Works - Earles Sidings on 08/04/03. 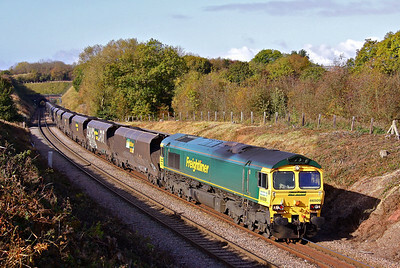 66509 hauls 6B52 10:37 Woodhouse East - West Burton loaded coal at Clarborough Junction, 17/10/09. 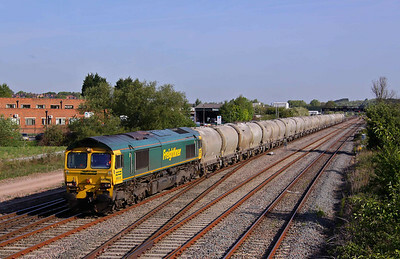 66509 speeds South at Trowell Junction with 6L45 07:35 Earles Sidings - West Thurock loaded cement tanks. 04/05/11. 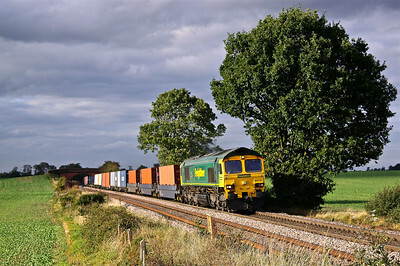 66510 passes Horbury Cutting with 6E06 09:32 Bredbury - Roxby containerised refuse train, 06/09/12. 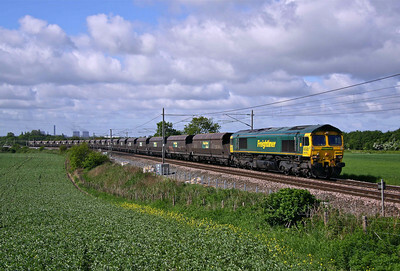 66510 passes Red Bank with 4C20 08:00 Fidlers Ferry - Carlisle empty coal hoppers on 01/06/13. 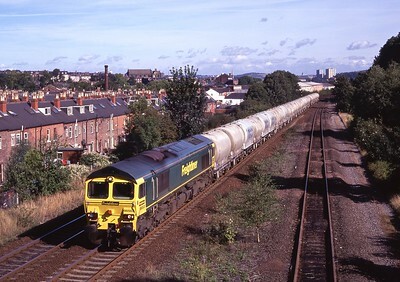 Fidlers Ferry Power Station cooling towers can be seen in the distance. 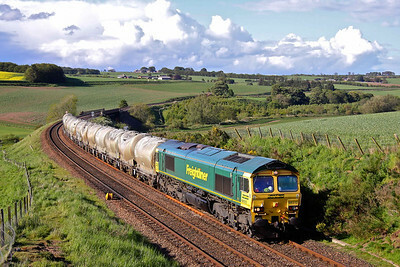 66512 sweeps past Inverkeilor with 6B32 16:52 Aberdeen - Oxwellmains empty cement tanks. 30/05/11. 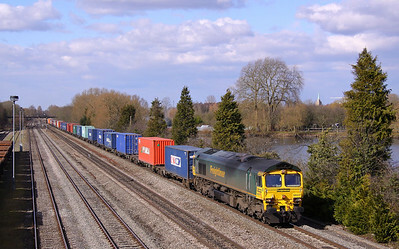 66517 passes Hinksey with 4O27 05:40 Garston - Southampton containers on 14/03/13. 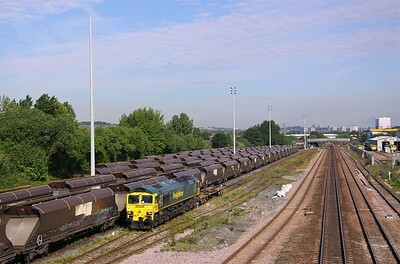 66518 starts its trip over to Guide Bridge, with 6K31 wheeling past scores of idle coal hoppers dumped in Hunslet Yard with just a single KFA (GMC 92502) in the consist on 04/06/15. 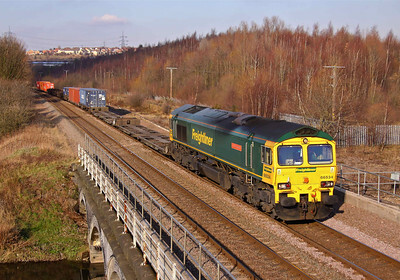 66519 approaches Whitley Bridge Station while working 6R08 08:12 Immingham Import Terminal - Drax loaded coal on 06/12/14. 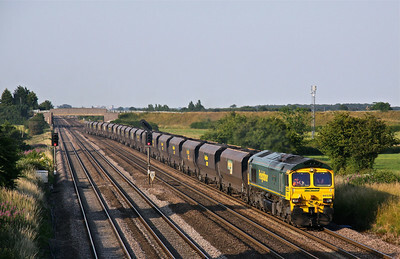 66522 in Freightliner/Shanks livery, passes Woodhouse Mill with 6A60 13:05 Hatfield Colliery - Ratcliffe Power Station loaded coal. 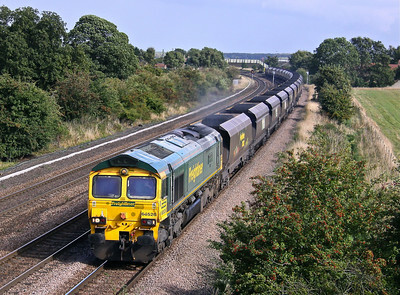 22/09/10. 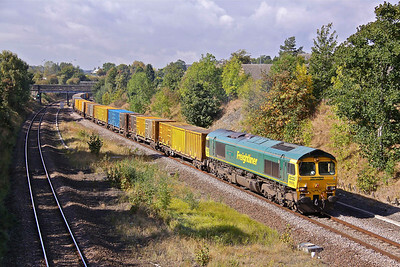 66523 hurries past Elford loop towing 6M49 08:00 Hull - Rugeley B Power Station coal on 08/10/13. 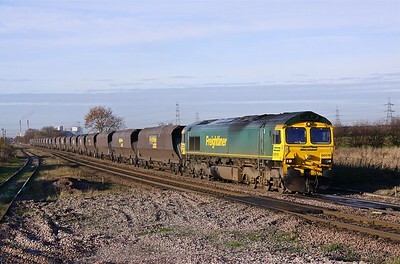 66523 slows to turn left at Joan Croft Junction with 4R37 15:02 Ferrybridge - Immingham coal empties. 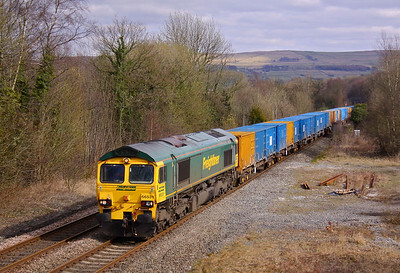 13/03/10. 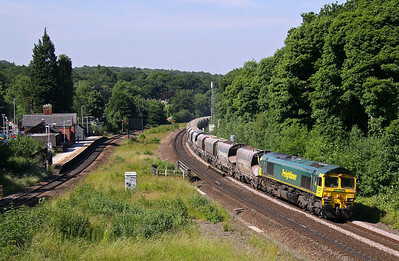 66524 sweeps through Horbury Cutting with 6E06 09:32 Bredbury - Roxby ‘binliner’ on 16/06/10. 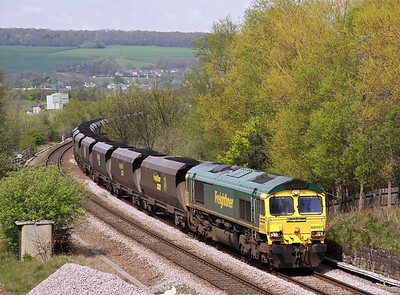 66526 'Driver Steve Dunn (George)' passes Horbury at Midday with 6E06 09:33 Bredbury - Roxby . 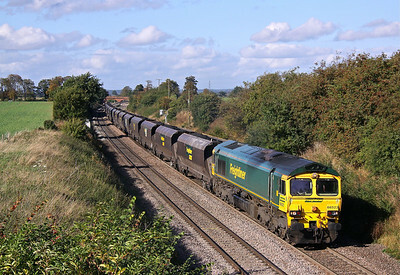 24/09/09. 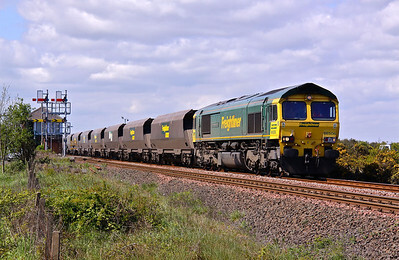 66526 ‘Driver Steve Dunn (George)’ passes Brumber Bridge with 6C14 13:53 North Blyth - West Burton power Station loaded coal on 16/07/13. 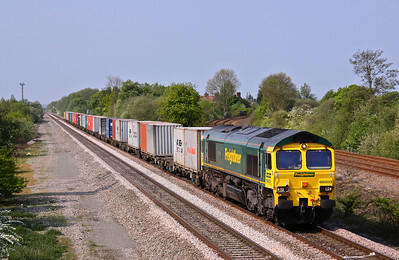 66531 passes Disley with 6M05 09:54, Saturday's, Roxby - Northenden empty bins. 19/03/11. 66532 ‘P&O Nedlloyd Atlas’ looks clean and smart as it passes Tupton with a fully loaded 4O95 12:12 Leeds FLT - Southampton ‘liner on 03/02/16. 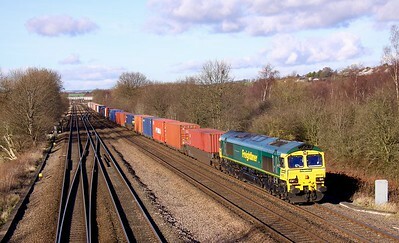 66534 'OOCL Express' hauls a lightly loaded 4O55 12:15 Leeds - Southampton container train over the River Rother on the approach to Beighton Junction, 03/02/12. 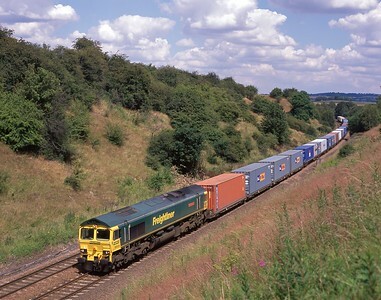 66534 ‘OOCL Express’ heads South past Barrow hill with 4O31 14:33 Leeds - Southampton freight liner on saturday 13/07/02.